Many birders show great compassion for backyard birds, and baby birds can be especially endearing with their soft plumage, fluttering wings, and insistent cheeping. Even the best intentions can harm baby birds, however, and savvy birders will avoid these mistakes whenever they find a baby bird. Spring and summer are baby season in the bird world, and many birds raise multiple broods of demanding hatchlings. As young birds grow, it can seem heartless when adults push them out of the nest and encourage them to set forth on their own, but parent birds always have the survival of their chicks in mind. No matter how tempting it may be, birders should avoid interfering with baby birds except in dire circumstances. While there are times when interference is necessary, most often the best course of action is to leave the baby bird alone. Move Them: Baby birds often leave the nest several days before their wings are strong enough to fly well. While these fluttering babies may initially seem abandoned, the parent birds are easily able to keep track of their young and will return to feed and care for the chick. Moving the bird may take it out of reach of its parents, denying it the essential care and instruction those parents provide. - The Exception: If the baby bird is bare-skinned and too young to have left the nest, it should be placed back in the nest so parents can continue to care for it. Similarly, if the baby bird is in immediate danger, such as on a busy street or in reach of predators, it should be moved to a nearby but safer location. Cuddle Them: While parent birds have a poor sense of smell and will not reject a baby bird because it has been touched by humans, the scent even a gentle touch leaves behind may attract predators to the young bird. Furthermore, baby birds have very fragile bones and handling them could inadvertently cause serious injuries, and they may carry mites or other parasites that can be detrimental to humans. - The Exception: If a very young bird cannot be replaced in its nest, it should be put in a warm location with soft towels or cloths to keep it warm until it can be turned over to a licensed wildlife rehabilitator. Baby birds can lose body heat rapidly if their feathers are not developed, and it may be necessary to help them stay warm, but they should not be held in the hand to do so. Study Them: Young birds are very susceptible to stress and while it can be intriguing to study them closely when they arrive in a yard, getting too close can be detrimental. Furthermore, a human nearby may keep parent birds from returning to care for their offspring. Instead, use binoculars to watch the baby bird from a distance so it does not feel crowded or threatened. - The Exception: When a baby bird is first spotted, it may be necessary to check it carefully for any sign of illness or injury. Once that observation is made, ideally without any physical contact, the bird should be left alone. Feed Them: Baby birds have very specialized diets that need to be high in protein for proper bone and feather formation. Malnutrition can lead to a range of health problems, even fatalities, and baby birds also require smaller bites of food they can easily digest, which they get from the regurgitated meals their parents provide. While baby birds may beg incessantly, that does not mean they are starving, and their parents will return with appropriate food as often as necessary. - The Exception: If careful, prolonged observations show that the parents are not returning to feed the young bird, it may need an emergency feeding. Ideally, this should only be done by an experienced bird rehabilitator who knows exactly what to feed baby birds to mimic their natural diets and fulfill their nutritional needs. 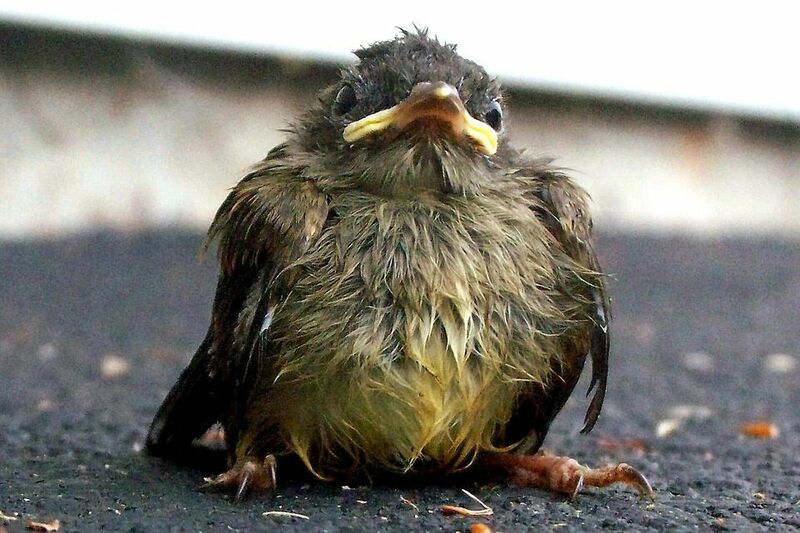 Adopt Them: It can be heart-wrenching to leave baby birds to care for themselves. That is the best course of action, however, as birds raised by humans will not develop the necessary behaviors to survive in the wild. Furthermore, keeping any wild bird captive, even with the intent to release it later, is a violation of the Federal Migratory Bird Treaty Act and can result in fines and criminal charges. While this law only applies to the United States, many countries have similar legislation prohibiting wild birds from being adopted as pets. - The Exception: When parent birds have been killed or otherwise do not return to care for their chicks, it may be necessary to care for the babies to ensure their survival. Because of baby birds' specialized needs, however, this can only be done properly by experienced rehabilitators, and birders should know where to find bird rescue organizations so any baby birds they find can receive the proper care. It is a harsh truth that infant mortality is very high among wild birds, and the majority of chicks do not survive to maturity. While it can be tempting to care for baby birds, understanding what not to do when finding young birds is essential to provide them the best chances for a healthy, wild life.